While going through some photos I realized I never posted these cupcakes! They are too delicious, not to share. I made these to take to the hospital to celebrate the arrival of my friends new babies. Yup, I said BABIES! Triplets! Remember the Peas in the Pod Cupcakes I made a while back for her baby shower? Well the babies arrived on Nov 19th, and were all home by Christmas Day! I was lucky enough to live within walking distance to the hospital, so I got to visit quite often while they were there and I got to see their tiny cuteness up close and personal. 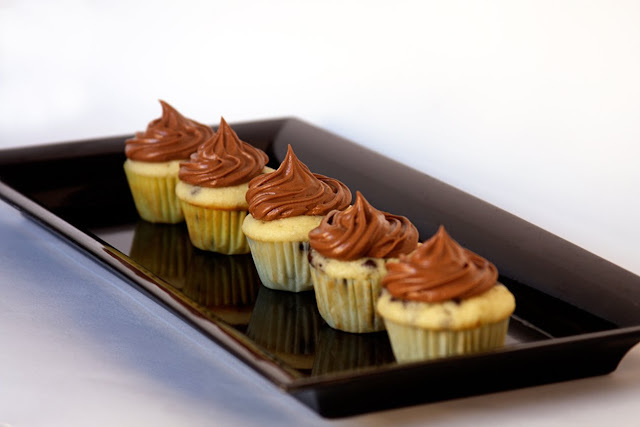 I thought the mini chocolate chips speckling the mini cupcakes were a perfect way to welcome such itty bitty babies into the world! Congrats Melissa & Jamie! 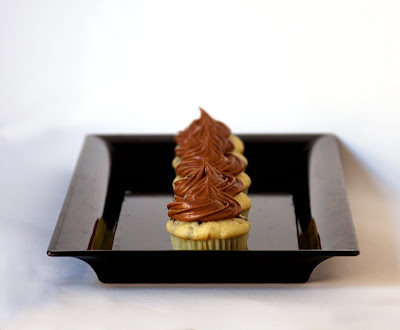 This chocolate frosting is so creamy and delicious, it paired perfectly with the moist & delicious cupcakes. Make these today, and you won’t be disappointed! In a medium bowl whisk together flour, baking powder, salt and sugar; then add chocolate chips. In a small mixing bowl, lightly beat the egg, then add milk, melted butter, and vanilla. Add to flour mixture and stir until just moistened. Divide among the prepared cups. Bake until the tops spring back when lightly tapped, 12-15 minutes. Remove from the oven and cool in the pan for 10 minutes, then transfer to a wire rack to cool. For Frosting: In a small bowl, sift together the confectioners' sugar and cocoa, and set aside. In a medium bowl, cream butter until smooth, then gradually beat in sugar mixture alternately with evaporated milk. Blend in vanilla. Beat until light and fluffy. If necessary, adjust consistency with more milk or sugar. I kind of want to crawl through the screen and eat one of these. YUM!! those are so cute & sound like the perfect little dessert! I think I need some of these right now!! 🙂 They look so yummy! These look soooo yummy! You're right, perfect for welcoming triplets! Why have I never thought of having chocolate chip cupcakes? These sound and look fantastic. Thanks! For the frosting, is that 2 cups of confectioners’ sugar? Yes, WHOOPS! It’s been corrected. Thanks! i made these in regular cupcake pans and they were horrible! I’m really sorry you had that experience! I loved them, as did my friend I brought them to. I might have enough mini-chocolate chips at home, perhaps I’ll make these again, just to make sure all the measurements are correct. These came out perfectly and were delicious! Thanks for the recipe! Thank you for the comment, I’m glad you enjoyed!